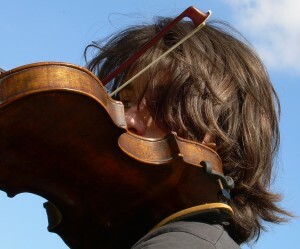 My musical process started when I was 4 and a half years old after being struck listening an old cassette tape of Angelo Branduardi (and in particular ” Dance in F sharp minor “), during a trip to the Fenis castle; from there started my passion for the violin and for so-called “ancient” music . At eighteen years old, after so many beautiful experiences around the world with the String Orchestra Giuseppe Tartini, I decided to close an important chapter of my life starting to dedicating to travel and to different studies. So, for a couple of years, I hung up the violin, waiting for my primal passion to resurface. With the passage of time, during popular festivals dancing around the fire (“… because where there is a violin everyone is cheerful! “), I returned slowly to my instrument, joining steadily a traditional celtic music group called The Storytellers. In the same period, I started a collaboration with Folk Road, a historic Irish group in Italy, which had been the personal soundtrack of my adolescence! On January 2011 I met the Senzaterra group: it allowed me to explore a repertoire (the center-south of Italy) that I had always been enjoyed listening, but that I had never attempted. Despite this, the members of the group still blame me to make “Irish” any kind of tarantella or saltarello I play! I spend my days usually walking in the forest and mountains, travelling by train, doing extra-university studies, odd jobs, playing during moon nights and many other things that (wretched me!) do not contribute at all to the GDP growth of our beautiful country. e ciò mi lacera il cuore nel petto atterrito di struggimento. verso là dove sogno e beata follia zampilla.